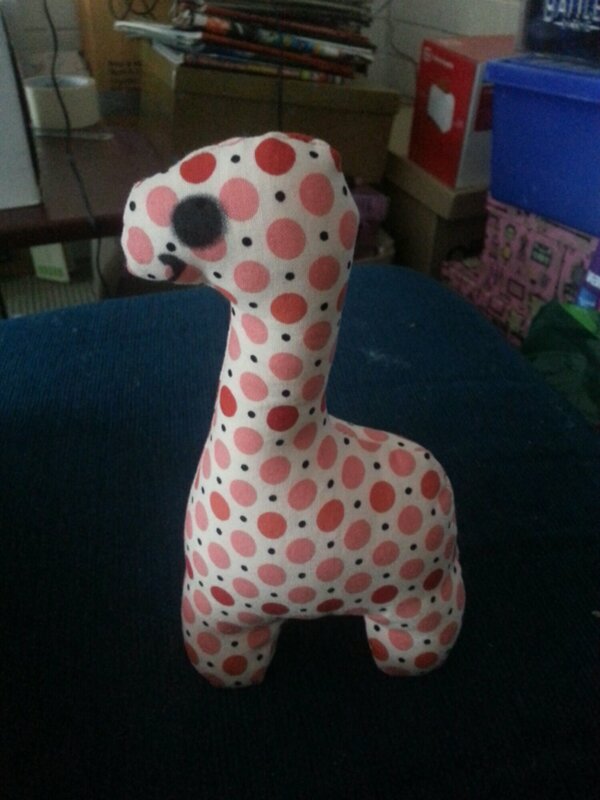 At least I shouldn’t need needle felting supplies for a while. They had no choice for colours, but at least it was a six pack and worked out cheaper than individual colours at the other store I go to. I got a handle with fine needles, and a heavy needle refill pack. They were pretty expensive, but I figure it’s an investment, reusable, and refillable, so it works out in the long run. Also five needles has to be quicker than one! 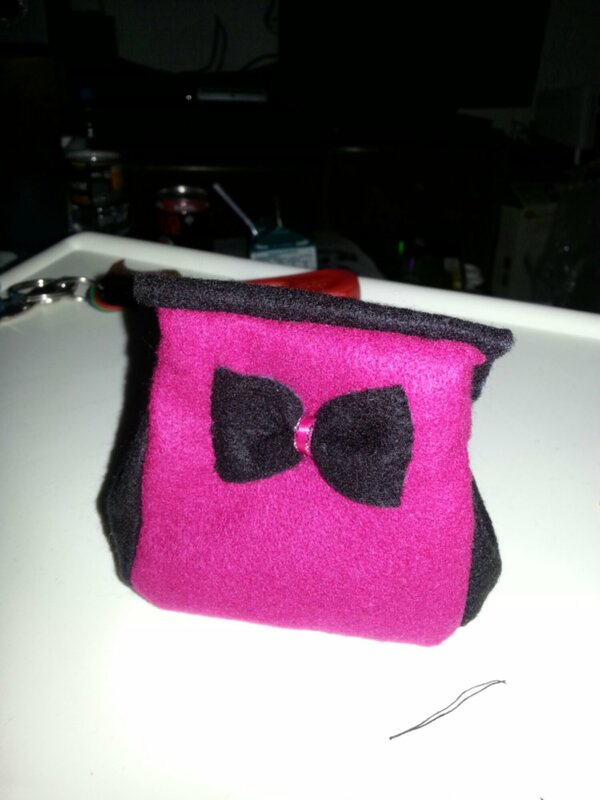 Amazingly, I discovered that I had barely any black felt in my big box of felt. This shouldn’t surprise me, as I love black and it matches everything, but my felt collection is quite large, so it was strange. We passed a lady selling beads and handmade bracelets. Well, we tried to pass, but failed miserably. 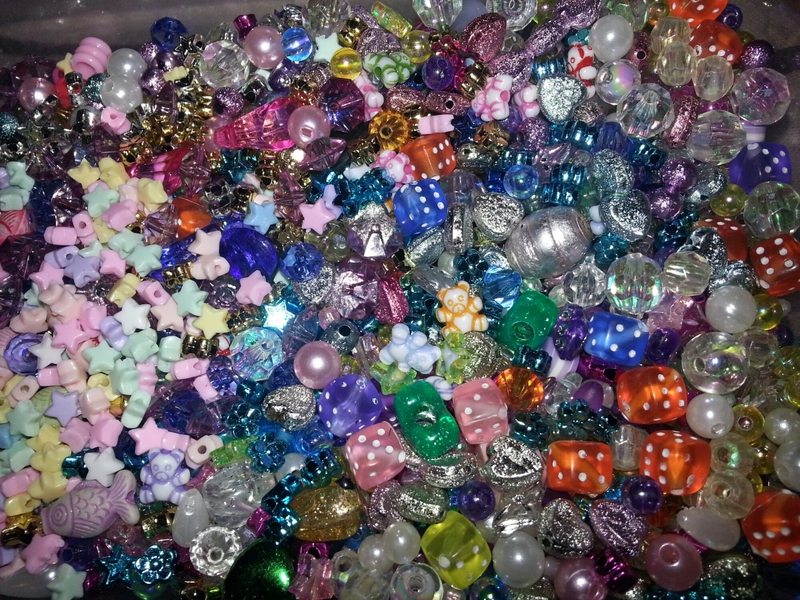 We spent ages picking out beads and bracelets, getting ideas and talking to the lady about her work. We spent more than we should have. You can look at some of her work here. 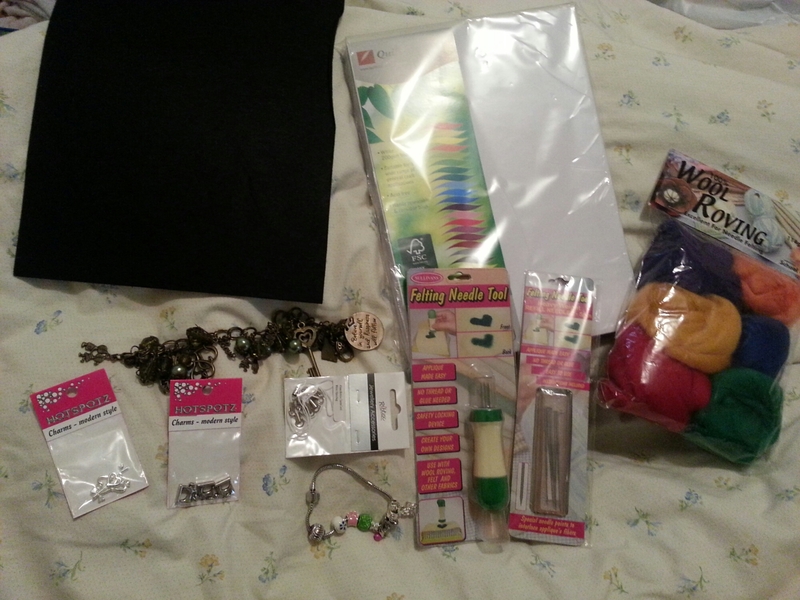 Other than that, I stocked up on plain white card, and bought some charms for a secret project. Couple of hours, and soreness all round, but nice haul. Now I need to sleep to have energy to play with my new, pointy toys :D.
Ugh. Headaches- the arch nemesis of creativity. I’ll riffle up some old pics to keep you entertained. I absolutely love this piece above, but I couldn’t finish it for two reasons. 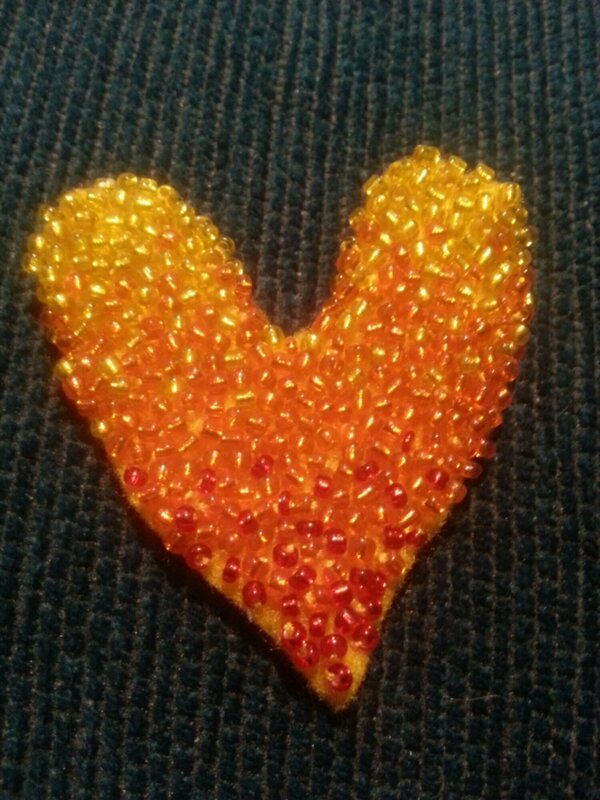 One, the colour wasnt staying on the beads. I know they were plastic, but they looked beautiful. I was going to experiment with coating the beads with clear nail polish after its strung but I wasn’t sure it’d keep any flexibility. Secondly, I had to match the gold of the ending to a chain and finding. I kept forgetting to take it and I couldn’t match it. So I kinda gave up. But I would like to recreate, and finish it, one day. 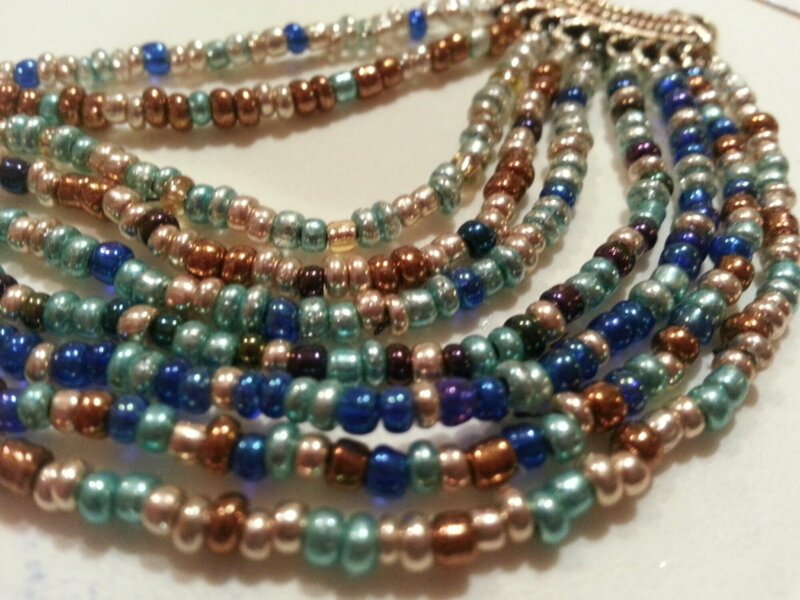 Played around with some beads. I didn’t use a pattern, since with the circles I’ve figured out the 3-5 rule. 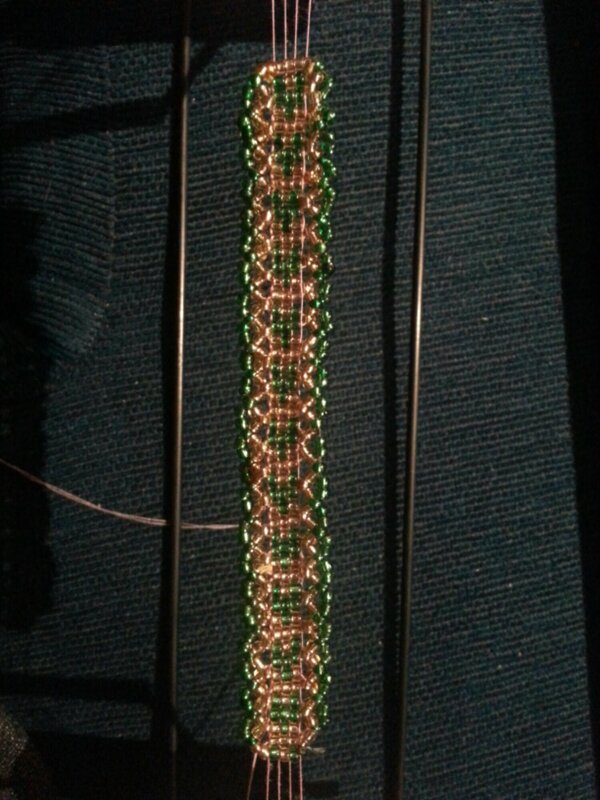 To keep a flat circle going, I do a round of five bead loops and then a row of three bead loops. 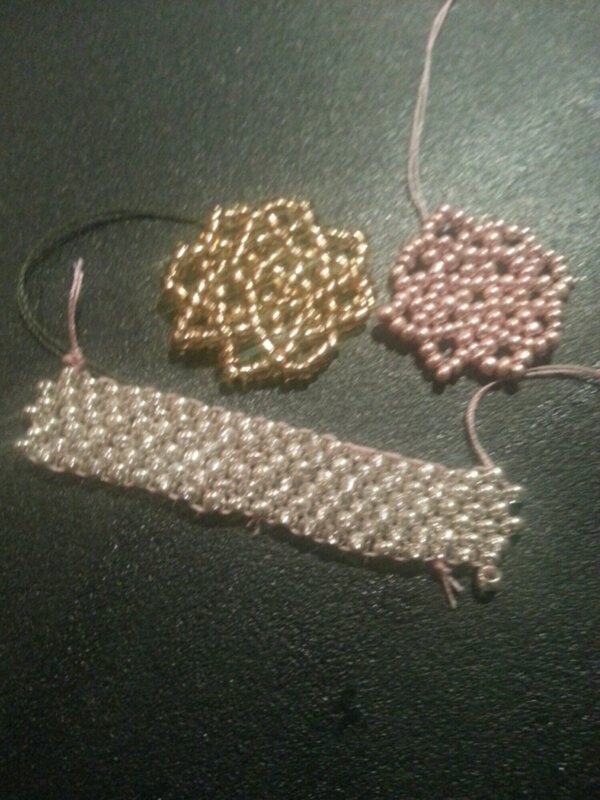 These started with 8 bead centres but it can be as big as you want as long as its even. 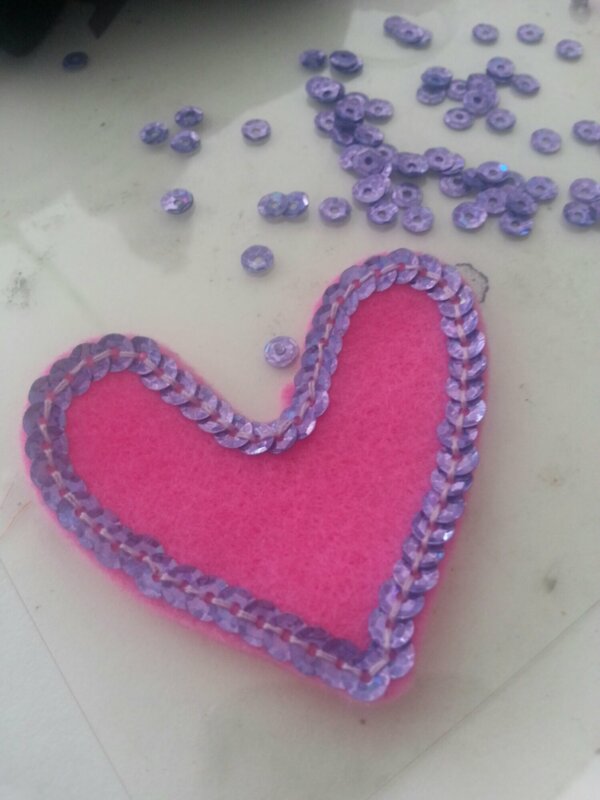 Beading tutorials are hard to follow, especially without pictures so I tend to create my own stuff. Unfortunately I’m not great at explaining things either, so I’ll just show you my pretties… maybe one day I’ll make a tutorial. 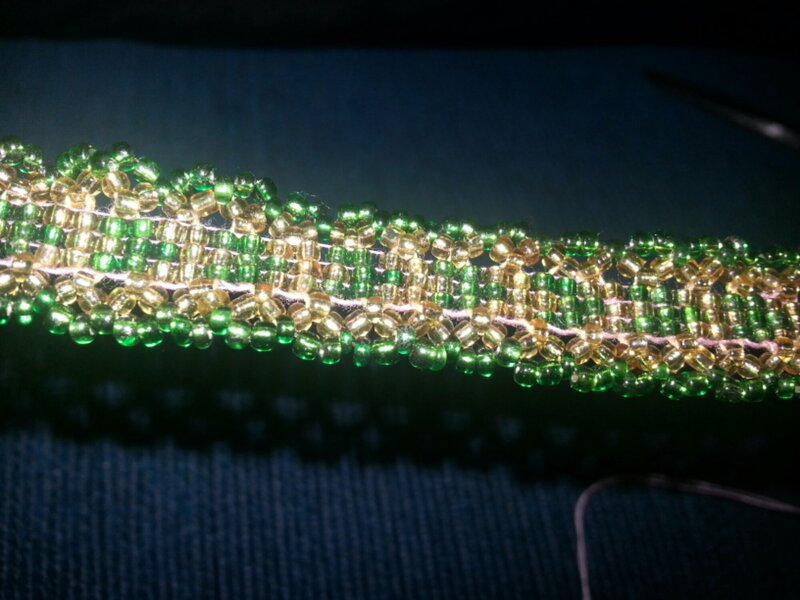 Felt like looming some beads… I started with a three bead wide chevron but used pink thread (through laziness) so I decided to “reinforce” and add more beads to cover the sides. I like it. 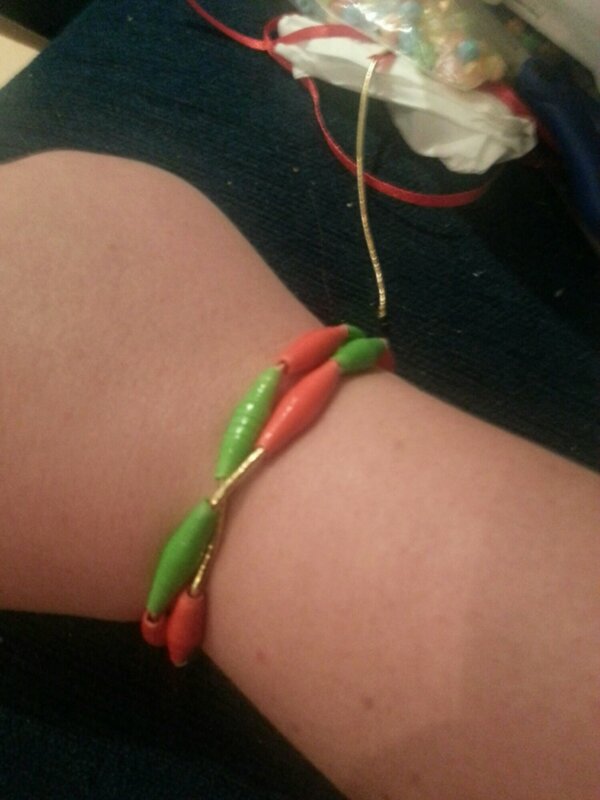 Too short for a bracelet… might be able to attach to some nice velvet ribbon for a choker… maybe. Today I was being lazy and found myself watching YouTube again. There was a tutorial recommended to me, to make these fabric butterflies. 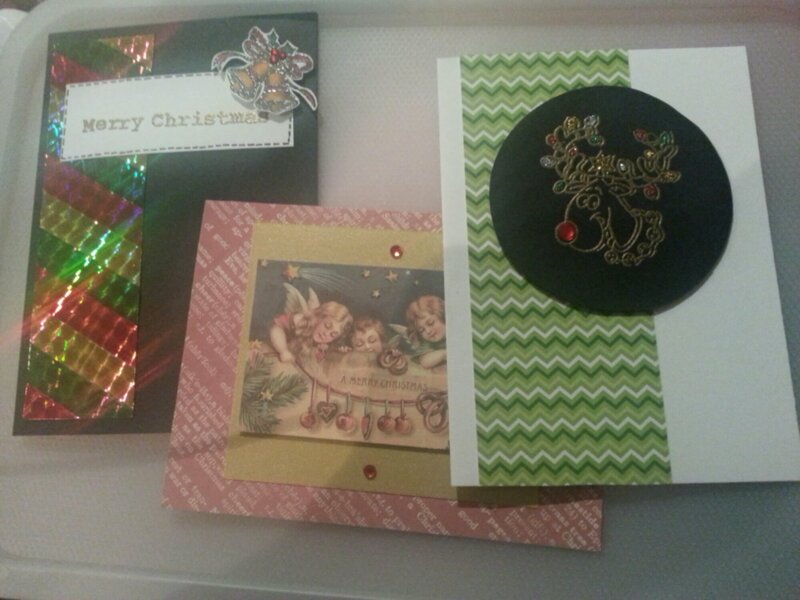 They looked pretty and we’re a copy of a shop brought version, and the lady copied it quite well, but went through unnecessary steps with ironing and glued where she could have stitched, as she was gathering each piece individually, then stuck them to some card. 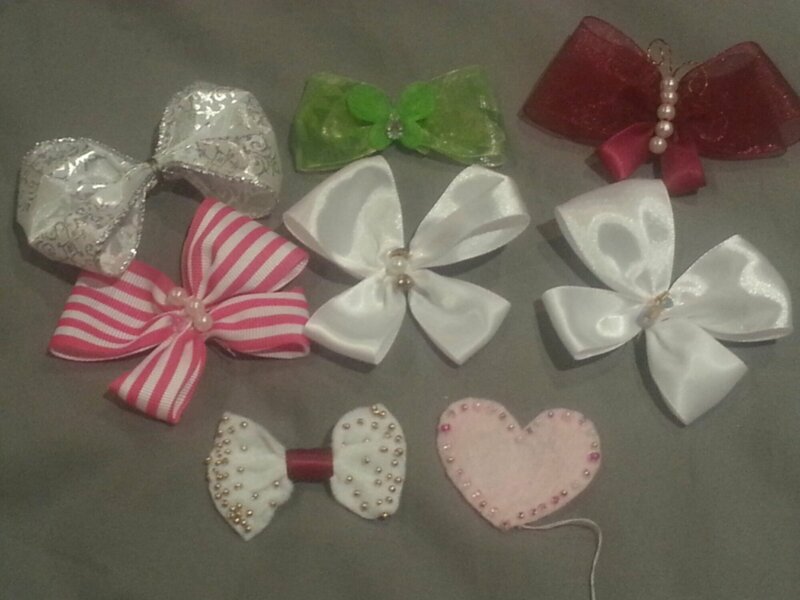 I made the above ones with ribbon and some beads. 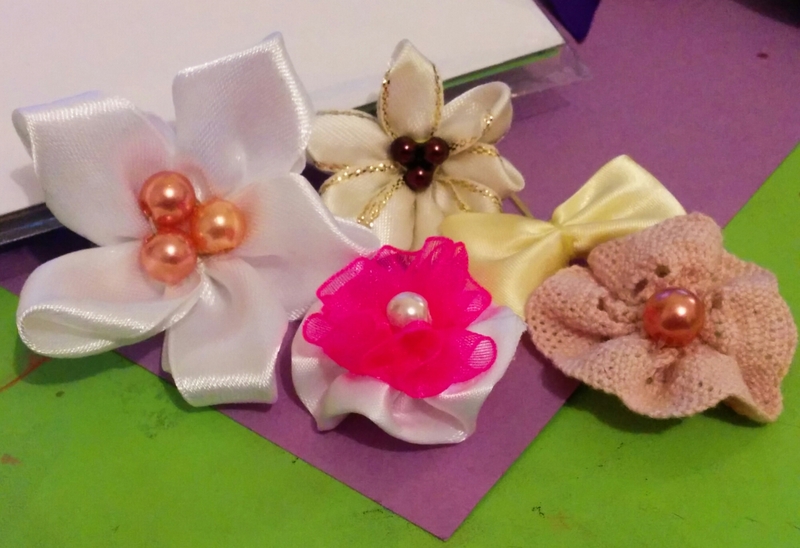 They were easy to make, and would look good on a headband, I think.